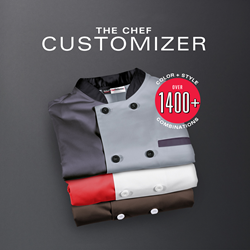 ChefUniforms gives customers and brands ability to create personalized coats with new chef coat customizer. ChefUniforms.com, a leading manufacturer and distributer of high-quality chef and hospitality apparel worldwide launches an innovative Chef Coat Customizer tool. Using the Artifi platform, customers can now order and coordinate their chef coats to the color scheme of their workplace to complete their brand’s image. To learn more about ChefUniforms.com and their chef coat customer, visit their website at http://www.chefuniforms.com. ChefUniforms.com is an apparel brand that manufactures and distributes high quality culinary and hospitality apparel worldwide. Chef Uniforms remains determined in their mission to provide a large selection of innovative high-quality chef apparel at the best prices. Chef Uniforms corporate office is based in Fort Lauderdale, Florida with a distribution center near Atlanta, Georgia. For more information, visit http://www.chefuniforms.com.